If your job requires you to understand, follow, and impact legislation, or if you're new to government affairs, here's your chance to get up to speed in one information-packed day. 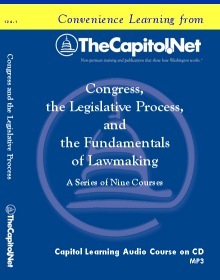 Variations of this course, Congressional Dynamics and the Legislative Process, and Understanding Congress and Capitol Hill Workshop, have been taught in Washington, DC, for more than 40 years by TheCapitol.Net and its predecessor, Congressional Quarterly Executive Conferences. This course and any combination of its topics are available as custom on-site training for your organization. We have tailored this course for attorneys, program analysts, administrative assistants, scientists, and others. For more information about how this training can help your members and staff, please contact our client liaison. Unanimous consent time agreements; the "hold"
This is a sample agenda: the actual topics may differ slightly. This course is available as a custom, on-site training program anywhere in the United States. 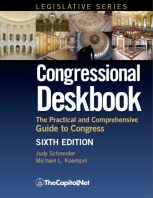 Suggested Prerequisites Basic understanding of congressional operations or a minimum of six-month's experience working with the legislative process, or completion of our Congress in a Nutshell course recommended. Fax or Mail: Print out and complete the registration form (in Adobe pdf) . The completed form should include your method of payment. "High-level, technical information presented in concise, relatable manner." "The use of anecdotes and examples to illustrate the issues was outstanding--really brought the subject to life." "Tons of info. Very good program." -- Manager State Government Affairs, Eastman Kodak Co.
"Perfect balance of basic historical background and complex procedural info. Strongly recommend." "Will allow me to understand the process behind ther budget and appropriations legislation affecting my department." "Being in the military, I feel all persons who handle Congressional Correspondence should attend this course. Highly recommended." "I have tried to learn this info by watching C-SPAN and reading an old Understanding Congress notebook, but this class is what I needed to bring it all together." 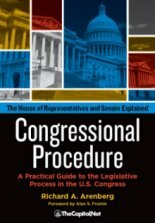 "Very helpful seminar--useful for anyone trying to make sense of the US legislative process." "I now know what my bosses do for a living." "Outstanding speakers with impeccable knowledge and experience." "I now have a better understanding of the working of Congress and I see why the legislative process can be so long. It all was very useful since this is a new area of work for me-I feel better equipped to perform the duties of my job." "Good background and useful printed material to use as a reference." "Better able to strategize regarding lobbying efforts and better able to inform my members on status of legislation." Our faculty for this course are all Hill veterans with current Hill experience.